The warranty on all cards is valid until January 2020. I bought them across Aria, Ebuyer, and Overclockers. I will, of course, help with any RMA claims that could happen in the future. A new Windows Server Insider Build has been posted and this one contains three exciting new features that could have a huge impact on future Windows Server users. This continues the march toward Windows Server 2019 with a new set of features intended to debut in that forthcoming release. You can read the official notification for build 17723 here. If you’d like to get into the Windows Server Insider program and test these builds yourself, you can do that here. In the immediately previous build, I recommended that you install directly on hardware to test out the new Hyper-V features. This one would not benefit as much, but it’s good to keep up on in-place upgrades if you can. If you find anything, use the Windows Server Insiders forums to report in. System Insights was introduced with build 17692. This new feature provides a framework for Windows Server to gather data and analyze it for predictive purposes. We can use it for performance trending more easily than using Performance Monitor and related tools. Build 17723 opens System Insights up to gathering data from any performance counter. It includes access to new features via PowerShell and Windows Admin Center. A container is simple to set up and tinker with. Directly managing them at even a small scale quickly becomes tedious. Managing containers in a public cloud can be even more difficult. Kubernetes is one option (known as a “container orchestrator“) for handling containers. Kubernetes can have a presence on a Windows Server installation for managing your on-premises containers. This build improves on Windows Server support for Kubernetes. I do not use Kubernetes often, so I didn’t push this far. The official blog post announcing the new build includes links to guide you through configuring Kubernetes. LEDBAT is one of those features that we’ve all wanted for quite some time. With LEDBAT, you can place server-side traffic of your choosing into a box, so to speak, so that it must always take a backseat to any other traffic. It will use only whatever bandwidth is left over when nothing else needs to use the network. While this would be a fun feature to test out and demo, Microsoft already has a fantastic article on the topic. It outlines the problem, gives some examples, explains why other approaches do not work, and demonstrates the feature in action. Let’s take a quick look at System Insights. Some of this comes from the official documentation page for System Insights. Adding the feature or its management tools does not require a reboot. The management tools are not truly necessary on servers if you will be managing them remotely. Note: Everything that you see here was performed using the 17723 preview of WAC, which is available at the same location as the Windows Server Insiders download. To use System Insights graphically, you can employ Windows Admin Center. If your WAC system is in gateway mode, it can pull data from remote systems. You must have the System Insights management tools installed on your WAC system using the above directions. Next, you must enable the plug-in within WAC. You will be prompted to confirm the installation. The plugin will then appear on the Installed Extensions tab. Note: I apologize for the poor scaling of the Windows Admin Center screenshots. I’m getting them as small and focused as I can while maintaining legibility. An ongoing UX problem with Windows Admin Center is that it has been optimized to run full-screen on 4k displays and is horrifically disrespectful of screen real estate on anything less. As for the error, I couldn’t find anything anywhere with more details. This is a preview, so maybe they’ll address that. We’ll see. If you click on one of the items, you’ll be taken to a screen that shows a history and forecast chart for the specific item. On my 1680×1050 monitor, I could not do anything to get all of the items into a single screen. So, I’ve broken it down into three parts so that the individual components will scale better. At the top of the page is just an overview that repeats what you saw in the table. Next, you have the aforementioned graphs. It takes up almost all of the screen and cannot be shortened vertically. Shrinking your window might cause it to become taller, though. Also, you cannot adjust the forecast term. Poor UX design notwithstanding, these charts might come in handy. But, we still don’t know what sort of accuracy to expect. Looking at it with my own analytical mindset, I don’t know why it forecasts such a radical change in CPU usage. But, this system has not been collecting data for very long. We’ll see how it does with more information. I would also like to discover if it extends its forecast after collecting more data. A prediction spanning less than 10 days is not terribly useful. Below the chart, you’ll find a listing of data gathering events. This will almost certainly require you to scroll if you want to see it. Fortunately, you probably won’t care about it often. I’m not sure why it’s not on a different tab or something. The new part here should be of interest to systems software developers: you can build your own System Insights plugins and install them with Add-InsightsCapability. You can find details and guides on the official docs page. This release presents some exciting new features for Windows Server 2019 that I look forward to implementing. Depending on how easy Microsoft makes it to build System Insights plugins, we could find ourselves with a wealth of performance forecasting modules in very short order. Enterprising systems admins might be able to architect their own. Even better, the WAC and PowerShell interfaces work better to view that data than most any other available tool. I still think the user experience in WAC needs a great deal of attention, but that concern is secondary to the capabilities. Expanded support for Kubernetes shows Microsoft’s ongoing commitment not only to container technologies but to work with outside entities to improve their viability on Windows Server. I would have liked to see more information in the article detailing just what was improved. I find the new LEDBAT technology to be quite intriguing. We’ll be able to use it to ensure that our critical server applications never become choked out without setting ham-handed restrictions on everything else. I feel that once the community gets hold of this, we’ll see many new applications that enhance our networking experiences. If you read my commentary on build 17709, you’ll know that I tried out the new in-place upgrade and ran into some frustrating problems. This time, I upgraded from 17709 directly to 17723 without any issues at all. I didn’t need to change a single configuration item. It did tell me that I had to shut down running VMs, but it did that during the pre-flight when I had yet to commit any serious time to the attempt. I don’t know if Microsoft intentionally improved something in the upgrade cycle or if my luck just changed, but I won’t complain. Lastly is a faulty Daysky notebook (mac book copy) I’m not exactly sure what’s wrong with this one as it all seems to be working fine and I’ve used Windows, connected to WiFi etc and everything seemed OK, but I don’t have a charger for it and it has ran out of battery now. FBI indictments unsealed Wednesday detailed the alleged crimes of three members of the FIN7 cybercrime gang who have been arrested and are in custody in Seattle. Ukrainian nationals Dmytro Fedorov, Fedir Hladyr and Andrii Kopakov were arrested by the FBI and are in custody. Each has been charged with 26 federal offenses, including conspiracy, wire fraud, computer hacking, access device fraud and aggravated identity theft. The FBI described the three hackers as “high-ranking members” of the FIN7 cybercrime organization — also known as the Carbanak Group — in a press release. The FIN7 group has been connected with attacks on more than 100 businesses and data breaches across 47 states in which “more than 15 million customer card records from over 6,500 individual point-of-sale terminals at more than 3,600 separate business locations” were stolen. The FBI admitted it didn’t expect FIN7 to disappear following these arrests, but framed the indictments as a major blow to the group. However, security vendor FireEye wrote in a blog post that while FIN7 may pause activity for a short time, the group would continue in one form or another. According to the FBI announcement, FIN7 primarily targeted companies in the “restaurant, gaming and hospitality industries,” across the U.S., U.K., France and Australia. The FBI described FIN7’s methods as using spear phishing, adding that the group “accompanied emails with telephone calls intended to further legitimize the email” in order to trick users into installing Carbanak malware. FireEye expanded on this based on its history of FIN7 activity, saying the group was connected to attacks across the U.S. and Europe in the hospitality, restaurant, travel, education, gaming, construction, energy, retail, finance, telecom, high-tech, government, software and business service industries. Kimberly Goody, cybercrime analysis manager at FireEye, based in Milpitas, Calif., also clarified the distinction between Carbanak malware and the commonly used Carbanak Group name via Twitter. We’ve previously reported that there are multiple sets of activity that have employed CARBANAK malware. One of these activity sets is FIN7. Calling a group by a malware name isn’t a best practice, as multiple actors/groups could be using it and thus causes confusion. The FBI noted that FIN7 even made attempts to appear legitimate. FireEye confirmed some of FIN7’s job postings through Combi Security. Microsoft announced three public disclosures from the 54 vulnerabilities released in the July Patch Tuesday. An elevation of privilege public disclosure (CVE-2018-8313) affects all OSes except Windows 7. Attackers could impersonate processes, cross-process communication or interrupt system functionality to elevate their privilege levels. The patch addresses this issue by ensuring that the Windows kernel API enforces permissions. “The fact that there is some level of detailed description of how to take advantage of this out in the open, it’s a good chance an attacker will look to develop some exploit code around this,” said Chris Goettl, director of product management and security at Ivanti, based in South Jordan, Utah. A similar elevation-of-privilege vulnerability (CVE-2018-8314) this July Patch Tuesday affects all OSes except Windows Server 2016. Attackers could escape a sandbox to elevate their privileges when Windows fails a check. If this vulnerability were exploited in conjunction with another vulnerability, the attacker could run arbitrary code. The update fixes how Windows’ file picker handles paths. A spoofing vulnerability in the Microsoft Edge browser (CVE-2018-8278) tricks users into thinking they are on a legitimate website. The attacker could then extract additional code to remotely exploit the system. The patch fixes how Microsoft Edge handles HTML content. Before July Patch Tuesday, Microsoft announced a new side-channel attack called Lazy FP State Restore (CVE-2018-3665) — similar to the Spectre and Meltdown vulnerabilities — on supported versions of Windows. An attacker uses a different side-channel to pull information from other registers on Intel CPUs through speculative execution. Microsoft also updated its Spectre and Meltdown advisory (ADV180012). It does not contain any new releases on the original three variants, but the company did update the Speculative Store Bypass, Variant 4 of the Spectre and Meltdown vulnerabilities. This completed coverage for Intel processors, and Microsoft is still working with AMD to mitigate its processors. Microsoft released out-of-band patches between June and July Patch Tuesday for a third-party Oracle Outside In vulnerability (ADV180010) that affects all Exchange servers. Alongside its June Patch Tuesday, Microsoft announced plans to switch the updating system for Windows Server 2008 SP2 to a rollup model. The new monthly model will more closely match the servicing model used for older Windows versions, enabling administrators to simplify their servicing process. This will include a security-only quality update, a security monthly quality rollup and a preview of the monthly quality rollup. “The 2008 Server users out there now need to adopt the same strategy, where they had the luxury of being able to do one or two updates if they chose to and not the rest,” Goettl said. The new model will preview on Aug. 21, 2018. Administrators will still receive extended support for Windows Server 2008 SP2 until January 2020. After that, only companies that pay for Premium Assurance will have an additional six years of support. For more information about the remaining security bulletins for July Patch Tuesday, visit Microsoft’s Security Update Guide. On May 27, a deluge dumped more than 6 inches of rain in less than three hours on Ellicott City, Maryland, killing one person and transforming Main Street into what looked like Class V river rapids, with cars tossed about like rubber ducks. The National Weather Service put the probability of such a storm at once in 1,000 years. Yet, “it’s the second time it’s happened in the last three years,” says Jeff Allenby, director of conservation technology for Chesapeake Conservancy, an environmental group. Floods are nothing new in Ellicott City, located where two tributaries join the Patapsco River. But Allenby says the floods are getting worse, as development covers what used to be the “natural sponge of a forest” with paved surfaces, rooftops, and lawns. Just days before the May 27 flood, the US Department of Homeland Security selected Ellicott City—on the basis of its 2016 flood—for a pilot program to deliver better flood warnings to residents via automated sensors. Recently, Allenby developed another tool to help predict, plan, and prepare for future floods: a first-of-its-kind, high-resolution map showing what’s on the ground—buildings, pavement, trees, lawns—across 100,000 square miles from upstate New York to southern Virginia that drain into Chesapeake Bay. The map, generated from aerial imagery with the help of artificial intelligence, shows objects as small as 3 feet square, roughly 1,000 times more precise than the maps that flood planners previously used. To understand the difference, imagine trying to identify an Uber driver on a crowded city street using a map that can only display objects the size of a Walmart. Creating the map consumed a year and cost $3.5 million, with help from Microsoft and the University of Vermont. Allenby’s team pored over aerial imagery, road maps, and zoning charts to establish rules, classify objects, and scrub errors. “As soon as we finished the first data set,” Allenby says, “everyone started asking ‘when are you going to do it again?’” to keep the map fresh. Enter AI. Microsoft helped Allenby’s team train its AI for Earth algorithms to identify objects on its own. Even with a robust data set, training the algorithms wasn’t easy. The effort required regular “pixel peeping”—manually zooming in on objects to verify and amend the automated results. With each pass, the algorithm improved its ability to recognize waterways, trees, fields, roads, and buildings. As relevant new data become available, Chesapeake Conservancy plans to use its AI to refresh the map more frequently and easily than the initial labor-intensive multi-million dollar effort. Now, Microsoft is making the tool available more widely. For $42, anyone can run 200 million aerial images through Microsoft’s AI for Earth platform and generate a high-resolution land-cover map of the entire US in 10 minutes. The results won’t be as precise in other parts of the country where the algorithm has not been trained on local conditions—a redwood tree or saguaro cactus looks nothing like a willow oak. A map of land use around Ellicott City, Maryland, built with the help of artificial intelligence (left) offers far more detail than its predecessor (right). To a society obsessed with location and mapping services—where the physical world unfolds in the digital every day—the accomplishment may not seem groundbreaking. Until recently, though, neither the high-resolution data nor the AI smarts existed to make such maps cost-effective for environmental purposes, especially for nonprofit conservation organizations. With Microsoft’s offer, AI on a planetary scale is about to become a commodity. Detailed, up-to-date information is paramount when it comes to designing stormwater management systems, Allenby says. “Looking at these systems with the power of AI can start to show when a watershed” is more likely to flood, he says. The Center for Watershed Protection, a nonprofit based in Ellicott City, reported in a 2001 study that when 10 percent of natural land gets developed, stream health declines and it begins to lose its ability to manage runoff. At 20 percent, runoff doubles, compared with undeveloped land. Allenby notes that paved surfaces and rooftops in Ellicott City reached 19 percent in recent years. Allenby says the more detailed map will enable planners to keep up with land-use changes and plan drainage systems that can accommodate more water. Eventually, the map will offer “live dashboards” and automated alerts to serve as a warning system when new development threatens to overwhelm stormwater management capacity. The Urban Forestry Administration in Washington, DC, has used the new map to determine where to plant trees by searching the district for areas without tree cover where standing water accumulates. Earlier this year, Chesapeake Conservancy began working with conservation groups in Iowa and Arizona to develop training sets for the algorithms specific to those landscapes. The combination of high-resolution imaging and sensor technologies, AI, and cloud computing is giving conservationists deeper insight into the health of the planet. The result is a near-real-time readout of Earth’s vital signs, firing off alerts and alarms whenever the ailing patient takes a turn for the worse. By the end of 2017, Planet deployed nearly 200 satellites, forming a necklace around the globe that images the entire Earth every day down to 3-meter resolution. That’s trillions of pixels raining down daily, which could never be transformed into useful maps without AI algorithms trained to interpret them. The partnership leverages the Carnegie Institution’s computer-vision tools and the University of Queensland’s data on local conditions, including coral, algae, sand, and rocks. “Today, we have no idea of the geography, rate, and frequency of global bleaching events,” explains Greg Asner, a scientist at Carnegie’s Department of Global Ecology. Based on what is known, scientists project that more than 90 percent of the world’s reefs, which sustain 25 percent of marine life, will be extinct by 2050. Lauren Kickham, impact director for Paul Allen Philanthropies, expects the partnership will bring the world’s coral crisis into clear view and enable scientists to track their health on a daily basis. In a separate coral reef project, also being conducted with Planet and the Carnegie Institution, The Nature Conservancy is leveraging Carnegie’s computer vision AI to develop a high-resolution map of the shallow waters of the Caribbean basin. “By learning how these systems live and how they adapt, maybe not our generation, but maybe the next will be able to bring them back,” says Luis Solorzano, The Nature Conservancy’s Caribbean Coral Reef project lead. Mapping services are hardly new to conservation. Geographic Information Systems have been a staple in the conservation toolkit for years, providing interactive maps to facilitate environmental monitoring, regulatory enforcement, and preservation planning. But, mapping services are only as good as the underlying data, which can be expensive to acquire and maintain. As a result, many conservationists resort to what’s freely available, like the 30-meter-resolution images supplied by the United States Geological Survey. Ellicott City and the Chesapeake watershed demonstrate the challenges of responding to a changing climate and the impacts of human activity. Since the 1950s, the bay’s oyster reefs have declined by more than 80 percent. Biologists discovered one of the planet’s first marine dead zones in Chesapeake Bay in the 1970s. Blue crab populations plunged in the 1990s. The sea level has risen more than a foot since 1895, and, according to a 2017 National Oceanic and Atmospheric Administration (NOAA) report, may rise as much as 6 feet by the end of this century. Allenby joined the Chesapeake Conservancy in 2012 when technology companies provided a grant to explore the ways in which technology could help inform conservation. 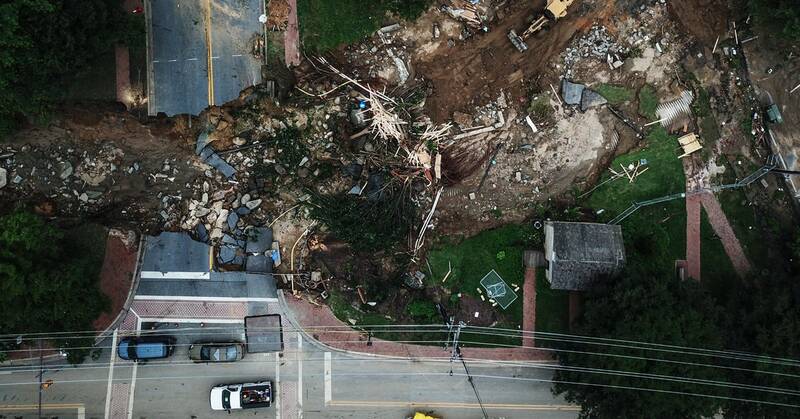 Allenby sought ways to deploy technology to help land managers, like those in Ellicott City, improve upon the dated 30-meter-resolution images that FEMA also uses for flood planning and preparation. In 2015, Allenby connected with the University of Vermont—nationally recognized experts in generating county-level high-resolution land-cover maps—seeking a partner on a bigger project. They secured funding from a consortium of state and local governments, and nonprofit groups in 2016. The year-long effort involved integrating data from such disparate sources as aerial imagery, road maps, and zoning charts. As the data set came together, a Conservancy board member introduced Allenby to Microsoft, which was eager to demonstrate how its AI and cloud computing could be leveraged to support conservation. The ultimate question, however, is whether the diagnoses offered by these AI-powered land-cover maps will arrive in time to help cure the problems caused by man. The 2017 13″ MacBook Air (MQD42B/A) was going to be a present for my now ex partner which was bought new from Debenhams around a month ago. The battery cycle count is 17 as I used it briefly to install some applications for her and put my music from my MacBook Pro (not the one for sale) onto it. It was Apple Warranty till 08/05/2019. There are no marks/scratches on either MacBook and zero dead pixels on either. The MacBook Air box is in perfect condition and the MacBook Pro box is in average condition. It currently retails for £1,099.00 on the Apple Store website and willing to sell for £960 inc P&P (Royal Mail Special Delivery before 1pm insured). It’s currently for sale on Amazon refurbished for £447.77 and willing to sell for £360 inc P&P (Royal Mail Special Delivery before 1pm insured). Would part with it for £505 inc P&P (Royal Mail Special Delivery before 1pm insured). Happy to trade + cash against one of them (maybe someone wants portability of the MacBook Air 13-inch instead of the bulky/heavy 2016/2017 MacBook Pro 15-inch.